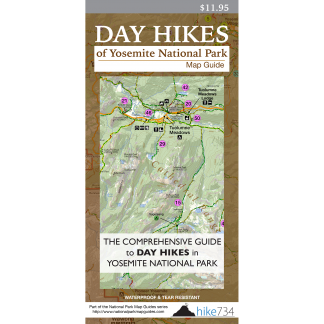 A natural spring and historic structures sit overlooking Tuolumne Meadows on this short, level walk. The hike begins on a gravel road, dotted with interpretive signs, through a mix of forest and meadows. 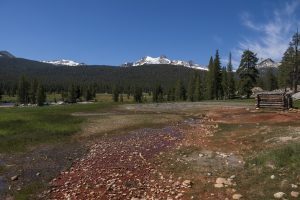 Glimpses of Tuolumne River, Tuolumne Meadows, and views of the Cathedral Range to the south open up as you take a right on the road up to Soda Springs and Parsons Lodge. The area around these carbonated springs is soggy, but a path leads you to the roofless, log structure surrounding the spring. Parsons Lodge is an old, rock building used for interpretive programs. From here, take the bridge over the Tuolumne River out to the meadows where a wide path takes you an additional 0.6mi/1km to the road. The meadows are an extremely sensitive vegetation area that can be destroyed by frequent impact so stay on the path to enjoy the flowers, wildlife, and views. This path can also serve as an alternative route to the springs but has less parking at the trailhead. Trailhead: Park at the signed Lembert Dome Picnic Area located at the east end of Tuolumne Meadows. The trail begins on the gated, gravel road that continues west. A small turnout on the north side of the Tioga Road just east of the Tuolumne Visitor Center serves as the alternative trailhead.